I LOVE the holidays! 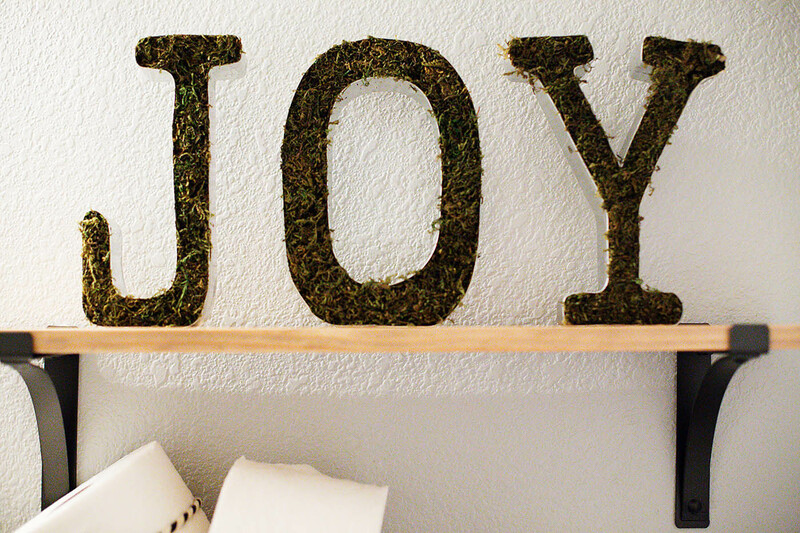 We love hosting little parties or having family stay during Thanksgiving and Christmas. This is the time of year that I make a list of things to get done around the house so I don’t have to think about all those little things right in the middle of the holiday rush. 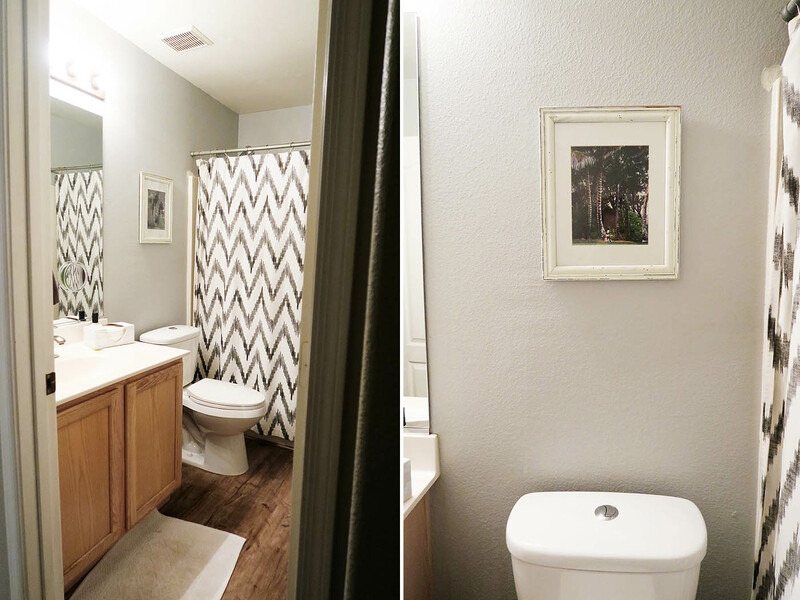 This year I wanted to fix up the guest bathroom a bit (which is the boys’ bathroom) because I hadn’t really done anything with it other than paint it when we moved in. I also wanted to make sure it was stocked for the guests now so I wouldn’t be running around trying to find extras at inconvenient times. Late at night is my favorite time to make a Target run for house projects. The aisles are usually pretty clear and I can think about all the little things I want to get! One thing I pick up regularly in this house is extra toilet paper! Cartwheel has a 5% off Quilted Northern Ultra Soft & Strong® Mega Rolls coupon (available 11/8-11/29) so I picked some up! I love the mega rolls because they don’t need to be changed out as often AND I don’t have to have as many out for extras. It was my first trip seeing the holiday decor out and I seriously had to keep myself on task! I’m heading back today to pick up more though. LOVE all the new stuff! 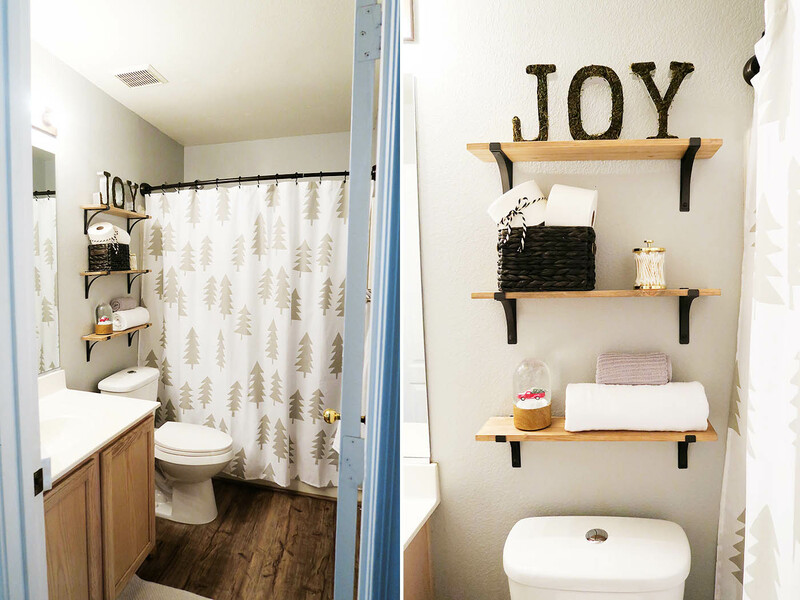 I stuck with my plan and got a few items to add a bit of storage and holiday decor to the bathroom. I still love this shower curtain but I saw one that was WAY too cute and perfect to pass up so I’ll keep this one to swap out after winter! The bathroom needed a new curtain rod as well so I picked up one of those curved ones that gives you a little more elbow room. My teen will appreciate that since he’s just about bigger than Jared now. My favorite addition to the bathroom are these 3 shelves. They aren’t deep so won’t hold a ton but they add a lot of character and allow me to keep items that guests might need out and ready so they don’t have to go digging around the cupboards to find them. Having extra Quilted Northern mega rolls out makes it easy for anyone to see right where it is in case they find themselves needing to replace the roll. I also added just a bit of holiday cheer. 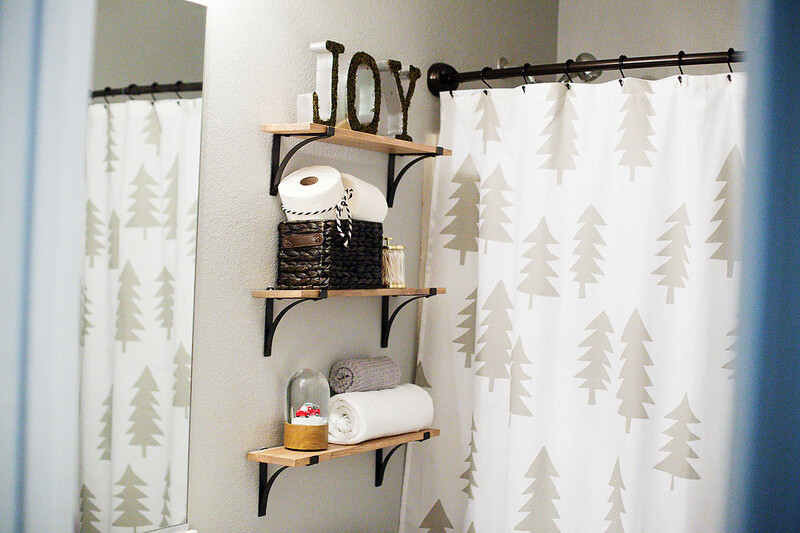 This is a fairly small bathroom so I wanted to keep it understated while still adding a bit of holiday fun. 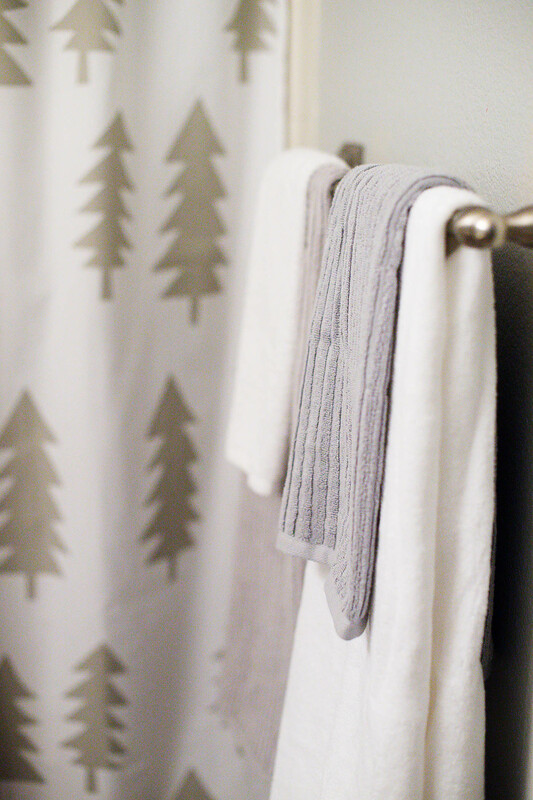 A few fresh new towels and my mini holiday bathroom decor update is complete and I (and the boys) love how it turned out! 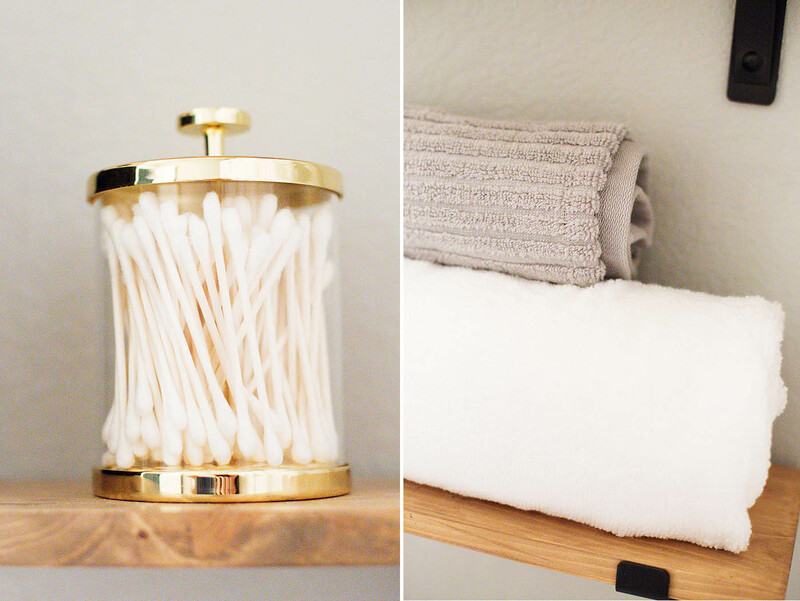 Keep it simple and easy to clean – not too cluttered. Keeping your linen color palette the same as the rest of your house means less washing loads (white and gray all over here). 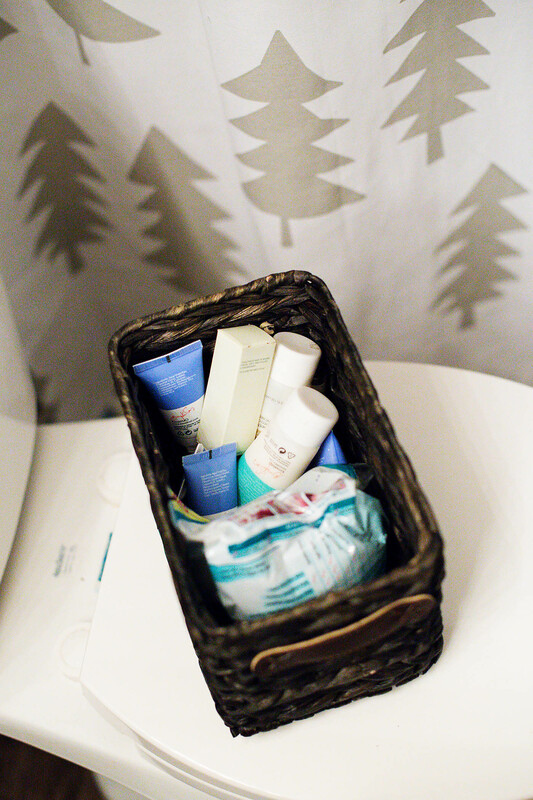 Hang on to the hotel samples and keep some in your bathroom for guests. Using the Quilted Northern Mega Rolls means less toilet paper rolls are needed in the bathroom and that you won’t have to check to switch them out as often. 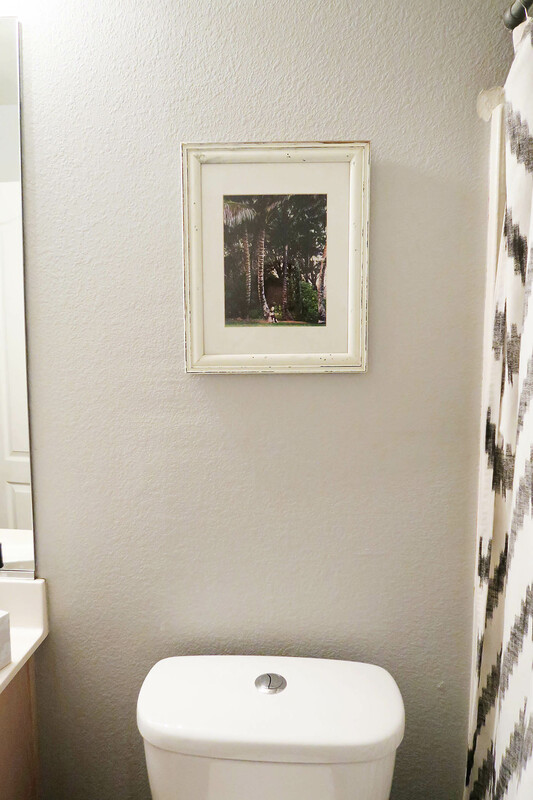 Keep a small bathroom feeling larger with light colors and lots of light. Before guests arrive make sure the water pressure is good, drains are clean and the fan works well. This bathroom has no windows so that’s super important in here! To find more Quilted Northern inspiration, check out the social hub here. Want a chance to win a $1,000 Target gift card? Enter using the widget below! 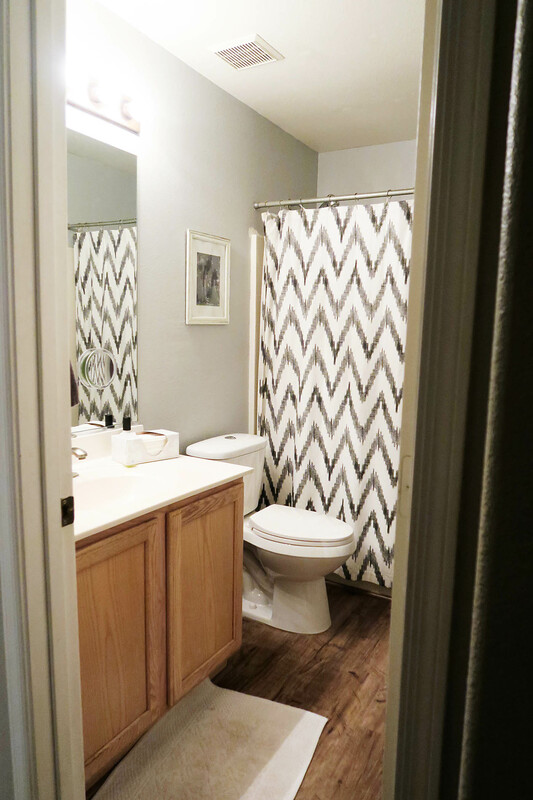 I love that shower curtain, you did such a great job with this mini makeover! I love to see bathrooms decorated for the holidays. I love this rustic look, the shower curtain, the neutral colora and the basket of tioletries for your guests! I love this idea! I love neutral tones as well!. 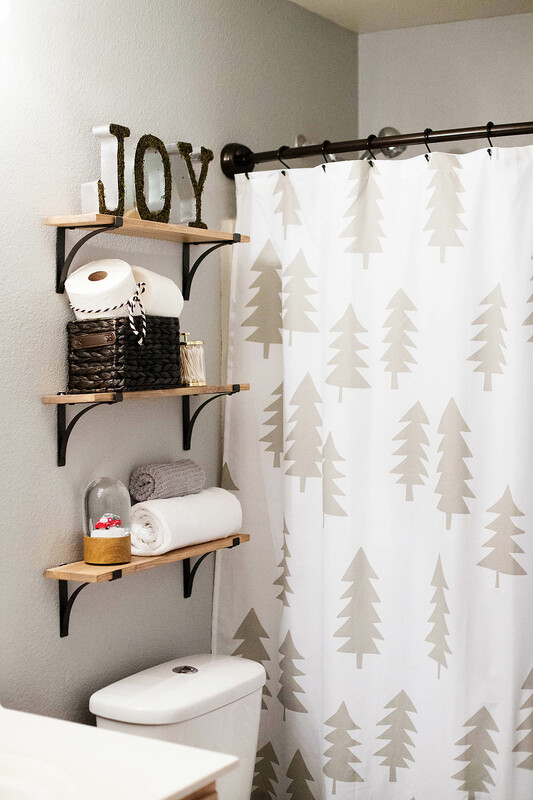 Where did you find cute shower curtain? I love it! I love going late at night as well. I love the shelves and your right that shower curtain is so cool. I love my Quilted Northern and it is the only one I buy! 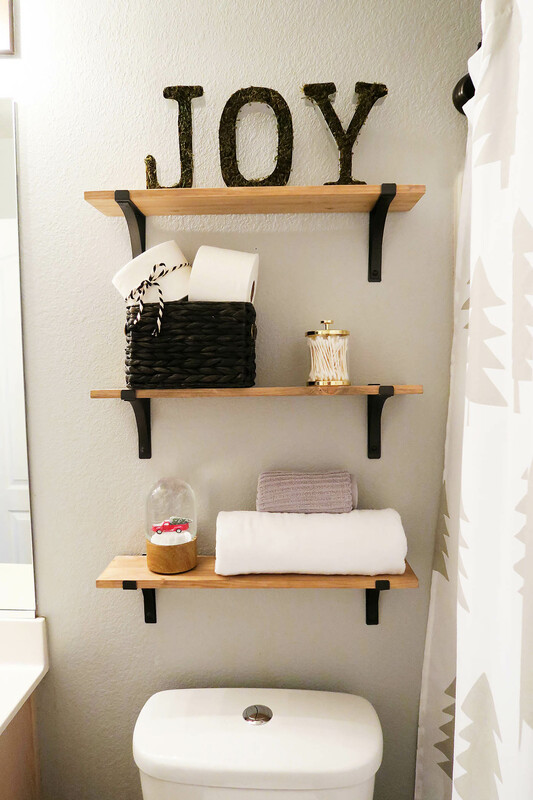 I love the shelves in the bathroom! 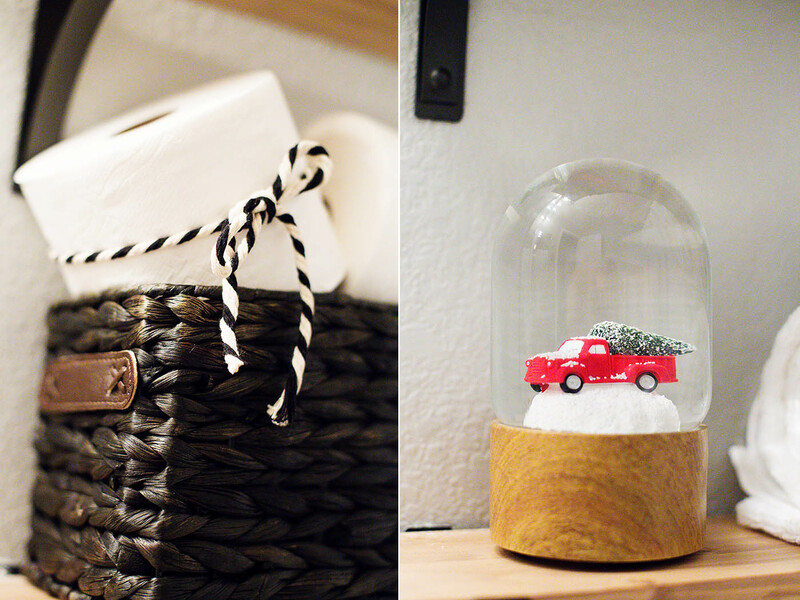 What a cute way to have additional storage and add some decor to the space. Thank you! I love them too, so glad we went with those ones!